Peracetic acid market to be primarily driven by growing product consumption across the F&B sector, global industry to chronicle its name in the billion-dollar business cosmos by 2025 « Global Market Insights, Inc. The increasing use of peracetic acid as a cleanser, disinfectant, antimicrobial, and sanitizer has been stimulating peracetic acid market share. End-use sectors such as f&b, bottling, and meat & poultry processing have been extensively using peracetic acid for disinfecting foodstuffs. In addition, for removing bacteria and fungi from fruits and vegetables, cleansing textile fabrics, processing papers, and treating wastewater, peracetic acid has been preferred on a large scale. The increasing development of production plants related to bottling, agricultural food products, and meat processing facilities have thus been having a significant influence on the peracetic acid market size. Regulatory bodies like FDA have also been playing a major role in the enhancement of product quality by providing guidelines for numerous industries over the use of peracetic acid. Driven by a supportive regulatory landscape and a widespread application spectrum, peracetic acid market trends are likely to receive a commendable boost in the years ahead. As of now, driven by the rapidly growing population, investments in the food processing industry have depicted a major rise, specifically in packaged food products. In accordance, regulatory organizations and other administrative bodies have implemented supportive policies to increase product adoption. This would perpetually impact peracetic acid market share, since most of the bottling plants use peracetic acid to reduce microbial contamination owing to its antiseptic nature. The product is also used in the brewing industry as a sanitizer. The shifting trends toward completely eliminating microbial contamination with aseptic packaging has turned out to be rather profitable for the bottling and beverage industry, since aseptic packaging provides a longer shelf life and minimum shipping costs. Aseptically packaging solutions are also preferred by high and low acid beverage producers, further increasing the demand for peracetic acid. Another additional benefit of peracetic based packaging is that there is no need to deliver the products through a refrigerated enclosure. In accordance, it would be rather overt to mention that the surging establishment of new brewing and dairy product plants will have a notable impact on peracetic acid market. For instance, a few months before, the American beverage company, Coca-Cola decided to invest USD 250 million to build a manufacturing and distribution plant in North Houston. This one-million-square-foot facility will start operating by 2020 with the production of plastic bottles and cans for water and sparkling drinks. In this rapidly evolving business sphere, taking into account the future opportunities renowned companies have been striving to strengthen their product portfolio by adopting various strategies. Validating the aforementioned fact, few days before, German-based chemical manufacturer, Evonik has signed agreement to acquire U.S.-based PeroxyChem for USD 625 million. PeroxyChem mainly manufacturers peracetic acid and hydrogen peroxide for the specialty applications. With this acquisition, Evonik would now be able to expand its portfolio of environment friendly and high-growth specialty applications. Through such strategic business initiatives, players in the peracetic acid market have been extending their regional reach and enhancing their customer base globally. Peracetic acid manufacturing companies have consistently been under regulatory scrutiny, however, the favorable regulatory framework has helped them establish advanced research and development facility centers. For instance, recently, EPA provided the green signal for Biosan’s newly developed product that can be used for disinfection and sanitization of laundry. This peracetic acid based product controls dangerous microorganisms like Pseudomonas aeruginosa and Staphylococcus aureus which are mainly found in the laundry pertaining to the hospitality industry. Aided by the supportive sanction from EPA, Biosan LLC has set benchmark for further development peracetic acid sanitizer. Increasing importance for peracetic acid across industrial and commercial spheres owing to its effectiveness and cost-saving features is thus poised to boost the product demand over the years ahead. 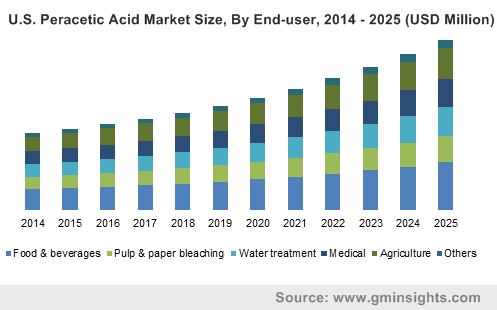 The changing approach of the companies toward enhancing their customer base with frequent mergers and acquisitions is also likely to strengthen the pace of peracetic acid industry over the years ahead. For the record, by the end of 2025, overall peracetic acid market will surpass revenue collection of USD 1.2 billion. This entry was posted in Bulk & Specialty Chemicals and tagged Agriculture, Distilled Grade, Food & Beverage, Global Peracetic Acid Market, Medical, Peracetic Acid Market, Peracetic Acid Market Size, Pulp & Paper Bleaching, Solution Grade, water treatment.